As one of the most commonly home kept fish worldwide there are many misconceptions about the Betta fish (also known as the Siamese fighting fish). For the potential Betta fish owner these misconceptions can be confusing and misleading. Hopefully this collection of Betta fish facts can clarify some of the more common misunderstandings about this brightly colored fish. From whether the Betta fish can really survive in a flower vase to whether two male Betta fish will really kill each other in a lake as big as Lake Erie. What is the Betta Fish? To begin it seems prudent to ask the simplest question there is when it comes to the Betta fish: what is the Betta fish? There are multiple recognized names for the Betta fish, most commonly: the Siamese fighting fish, the Betta and Betta splendens. These fish are native to the rice paddies of Malaysia, Thailand and Cambodia. Male Betta fish are particularly territorial and will not tolerate another male within its established territory. Two confronting male Betta fish will shows signs of aggression in an attempt to scare the other male away, these signs of aggression will often turn in to fighting. Fighting between two male Betta fish can lead to the death of one of the two fish if neither submisses nor swims away; however, this does not occur frequently. Why is the Betta Fish known as the Siamese Fighting Fish? A number of people commonly refer to the Betta fish as the Siamese fighting fish; this is due to the history of the fish. The people of Thailand, formerly Siam, were known for collecting these fish and breeding them to increase aggression. As increasingly aggressive fish were bred, fights would be held as a recreational activity and money would be placed on these fights. As this type of fish fighting became increasingly popular the king began to collect these fish himself and license them. In 1840 the king gave some of his fighting fish to a man who would go on to give them to a medical scientist who would scientifically identify the fish species. When first described by the medical scientist Dr. Theodor Cantor the Betta fish species was termed “Macropodus Pugnax.” It was nine years later when another man, Mr. Tate Regan, would identify that there was already a species in existence with this name and rename the Betta: Betta splendens. Why Are the Betta Fish Named Betta Fish? We have already covered how the Betta fish became known as the “Betta splendens,” but another common question is why this name was chosen. There is some degree of disagreement when it comes to why this name was selected; however, a number of researchers believe that the name was taken from the Bettah people of ancient Asia. The Bettah people were an Asian tribe known for being warriors, much like the Betta fish that had been engineered by the people of Siam. Just How Aggressive Are Betta Fish? The Betta fish became known for being incredibly aggressive as a result of targeted breeding by the people of Siam; however this degree of aggression is not common for the naturally occurring fish. Certainly two male Betta fish are not approving of each other when they swim past territorial bounds; however, in nature these encounters rarely result in death. The naturally occurring Betta fish males will show signs of aggression, such as making themselves appear larger by flaring their gills and in the majority of cases one of the fish will back down and swim away. With the targeted breeding that took place in an effort to create optimized fighting fish however; many Betta fish bred in captivity will fight to the death. How Does Territory Size Play in to the Mix? It is said that placing two modern day Betta fish males in to a lake the size of Lake Eerie would result in the death of one of the two fish. There are a number of factors which would play in to the mix when this example is used. For the most part it should be known that this statement is simply untrue. Betta fish males do establish their own territory and when confined to significantly small areas and confronted with another male a death match can ensue. When placed within an incredibly large territory however, the two male Betta’s will establish their territories and generally stay away from each other. Should the fish run in to each other’s territorial bounds a fish will undoubtedly ensue, but even then with a geographic location so large it is unlikely that the two will fight to the death unless bred to be exceptionally aggressive. Are Betta Fish Still Bred to be Aggressive? While in the 1800’s the Betta fish was bred by the people of Siam to be an aggressive fish over the years this selective breeding has switched focus. For the most part Betta fish that are bred today are bred for color, tail features and fin features rather than for a propensity for aggression. There are still those who breed their Betta’s for aggression but this is not as commonly seen in this day and age. Where male Betta fish are recognized for their gill flaring expressions of anger these expressions are also used in an effort to “flirt with” female Bettas. Unknown to many Betta fish owners however, is the fact that female Betta fish too will puff out their gills in expressions of both courting and intimidation. Female Betta fish are nowhere near as aggressive as males of the species and while they will show signs of aggression towards other fish these signs generally consist of chasing away the offending fish rather than aggressive nipping behavior. Why Are Betta’s Bred for Color? It is a common misconception that the Betta fish is a brightly colored and decorated fish. As the Betta fish occurs naturally in the wild it is actually a brown to dull olive green color and shows no resemblance to the rainbow of colors seen in local pet stores. The natural Betta fish only shows a hint of color when provoked in to aggression. As Betta fish breeding became more popular however, the males of the species were bred selectively in order to produce the most visually appealing color combinations that appear all of the time rather than just when the fish became aggravated. Female Betta fish do not possess the same ability to exhibit bright colors as males and as such they retain much more dull coloration. What Colors Are Engineered Betta Fish Males? There is a wide variation in the colors of the Betta fish males of today. With so many selective breeding programs going on new color combinations of these fish are appearing all of the time. Some of the most commonly found color combinations for male Betta fish include: red, blue, orange, turquoise, yellow, bright blue and pink, cream, green and white. How Do Betta Fish Get Their Colors? Many people assume that the Betta fish gets its coloration through skin pigmentation but this is not true. The colors of the Betta fish are caused by the presence of guanine crystals present within a layer on the fish’s scales, this is how the colors of certain Betta’s can appear to shimmer or change. A photo slideshow of some beautiful species of Siamese fighting fish, showcasing their behavior. The video is by Dr. Jörg Vierke. What Fin Variations of the Betta Fish Exist? The female Betta fish does not exhibit the long and elaborate fins and tail of the male Betta fish. When bred in captivity male Betta fish are commonly bred to create even more elaborate fin and tail structures. Cross breeding two Betta’s with a genetic predisposition to tail type can create new variations of the fish. Some of the common fin / tail variations that can be found in the Betta splendens include: the dragon scale, the delta tail, the rosetail, the halfsun, the delta tail, the double tail, the veiltail, the combtail, the crowntail, the half moon and the short-finned fighting style. The short finned fighting style of Betta fish were bred specifically for the purpose of fighting the fish due to the fact that smaller fin structure result in less damage during a confrontation. 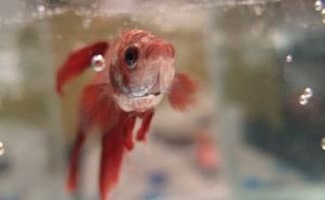 How Should Captive Betta Fish Be Kept? It has already been mentioned that common day Betta fish males can be extremely aggressive and as such two male Betta fish should never be kept within the same tank. Even the larger aquarium is not large enough for two male Betta fish to happily survive so it is best to always keep males of the species in separate living quarters. When it comes to the female Betta fish however, there is significantly less aggression and with a nice roomy aquarium three female Bettas can live happily together. Many times people see the Betta fish in small cups in their local pet store and assume that these fish can thrive in a small environment. While the Betta fish can survive in shallow waters for periods of time as they would in the wild rice paddies, they are not happy to do so. Like any other fish the Betta fish is happiest with a tank that offers enough room to swim around in and exercise in. It is also important to note that the smaller the tank used for a Betta fish the more frequently water will need to be changed. As a fish tends to sully the water in their tank it is always best to go with a larger tank that can offer a much more improved water quality as the filter in the tank gets to work. So how big is too big when it comes to the right sized tank for a Betta fish? There really isn’t a tank too large for a male Betta fish; however, these fish rarely survive well in community tanks so it is best to limit the size of your Betta fish’s tank. The recommended tank size for a Betta fish is around 12 gallons; this provides plenty of clean water to cycle through the tank and plenty of room for the fish to exercise. Can Betta Fish be Placed in Flower Vases? At some point in time someone decided to place a Betta fish in a filled vase that also contains flowers – most commonly lilies. It is the belief that the plants will not only offer nutrients to the fish but they will also oxygenate the water and provide something beautiful to look at. To get right to the point though, Betta fish are not happy in a flower vase. The cramped space gives very limited room to swim around and the flowers do not offer adequate nutrition to the fish. In addition the flowers in the pot create stagnant water which makes it difficult for the fish to survive. 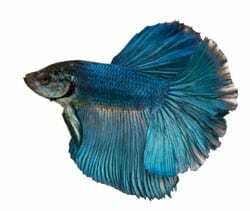 In general the Betta fish is a hardy fish that is able to survive in a number of atmospheres but when the water from a Betta fish tank is not cleaned appropriately it can quickly begin to harbor illness. Parasites and rot are two of the most commonly found illnesses in Betta fish which can be contracted through dirty water or an unsanitary tank environment such as one with stagnant water. Parasites can also be contracted through food consumption. If Betta fish are not kept in sanitary conditions that are likely to contract some type of illness or parasite. Many times because they are not well educated in terms of fish keeping, fish owners will write off their Betta fish as a lost cause once it begins to show signs of illness. Simply because a Betta fish has contracted an illness does not mean that it should be written off and left to die, in fact there are a number of products developed to treat the most common Betta fish diseases. Most of the illnesses that the average Betta fish owner will experience can be treated with a thorough tank cleaning and the administration of antibiotic drops that go straight in to the clean tank. It is crucial that Betta fish diseases or illnesses be caught as soon as possible in order to prevent their progression because there are times when severe progression of a disease will cause death. One such disease is fin rot. Fin rot comes from extremely unsanitary water and the Betta fish begins to experience dissolving of the fins. If left untreated the fins will completely dissolve and the illness will begin to eat away at the body of the fish until there is nothing left. With all of this said, there are a small number of illnesses that can be contracted by a Betta fish that mean certain death. The most recognized of these illnesses is tuberculosis. Tuberculosis cannot be cured in fish and the most humane thing that can be done for any fish with this illness is to simply keep the fish comfortable in a clean and isolated tank until it dies. Learn more about Betta fish diseases. Can Fish Diseases Be Caught By Humans? One concern that anyone who has dealt with a diseased fish can attest to is the contagion of fish disease. While fish diseases tend not to be contagious to humans they can be carried from one fish to another by human contact. If you keep multiple tanks and handle one fish with a parasite and go on to handle a second without washing thoroughly, the disease can be spread to another fish. Whenever you find yourself handling any fish it is important to wash your hands thoroughly with antibacterial soap both before and after the handling to ensure that the disease will not spread to other fish. If a sick Betta fish is being kept with other fish in a community tank then there is a high likelihood that other fish within the community will contract the disease anyway but it is still prudent to isolate the affected fish. The Betta fish is an incredibly popular fish species and as such it is increasingly important to become more educated in reference to this fish. From the natural living conditions to aquarium living, there are a number of important elements in keeping a healthy Betta fish. For those inexperienced with fish keeping the Betta fish is a great place to start; however, it is important to understand the needs of the captive Betta in order to create a healthy lifestyle for your new fish. Unfortunately many people underestimate the knowledge and understanding that goes in to keeping a fish successfully and as a result the lifespan of their Betta fish is reduced significantly. While this article certainly does not cover everything that you need to know in order to keep a happy and healthy Betta fish it does cover a number of aspects that you should be knowledgeable of before bringing a Betta fish in to your home. While a Betta may “only” be a fish, it is still a living breathing organism that depends upon its owner to provide optimal living conditions. Without a regularly cleaned tank, appropriate tank mates (or lack their of,) a healthy diet, an appropriate food source and the correct medicinal ointments on hand the expected lifespan of a captive Betta fish will reduce from two to five years to just a few weeks or months. I have a 20long tank filled half way with water. It’s more of plant tank filled with semi aquatics. I stocked it with one male and one female. They flirted and played… Till one day the male was dead on the bottom being eaten by the ghost shrimp. So I let her live her life alone as an old butter widow. Now, a year or two later, I tried again. Didn’t realize she got so big. The male looked tiny in there. Same thing happened. Flirting, playing… Dead male..
My question is: will she care about smaller fish of a different species? Or is she just going to kill anything smaller than her that I put in there? Well if she thinks the male can be harmed cause he’s smaller then yes. Adam, thanks for the kind words and feedback! And greatly appreciate you including Earth’s Friends as a resource on your article! You’ve got a great site too. I have a Betta fish, a crimson male veiltail who is little over two years old. I keep his tank extremely clean and change the filter every other week. Today I noticed something peculiar though. It seems he is losing pigment in his front and tail fins. He doesn’t seem to be in any distress, pain, and I do not see any signs of rot. He’s always had a white chin since the time I first picked him up and has since formed in the facial shape kinda like that of a doberman. Is this normal? If he is acting normal, then I don’t think it will be a problem. I know that there are some Betta genetics that change the colors of the fish’s fins as he ages. I have never heard of a Betta being that old when it happens though. The white face is called piebald- it is when the face of the fish is lighter than the rest of the body. I had a male marble butterfly double tailed half moon Betta that also had piebald coloring. It time for a bettafight who wants to take on my MUHAMMAD ALI STYLE bettafish are you chicken. I’m getting a pair of fighter plakat bettas for breeding that will have lots of babies once the babies become mid adult they will start their stamina training I don’t have to teach these how to fight they already know how. They just need stamina training when done 3 will be given to Cambodia for fighting their fight style will be multidimensional they will be outside fighers aswell as inside fighters they will have at am I for 7 to 8 hours they will in Cambodia tire out their opponent make him miss bites then become the inside fighter giving multiple bites his opponent will bite back but miss this will continue then the opponent will give up. That’s why mine are the GREATEST fighter plakat bettas since boxer MUHAMMAD ALI that’s why mine will be 20* fighter plakat bettas. I think I would like to have another Betta fish in the near future as they do make nice additions to a single home. I liked the thought of having another living thing in my apartment, but definitely one that did not talk or make a lot of noise (or any at all for that matter) and was relatively easy to care for. If I do end up getting another Betta, I will first purchase a much bigger tank and invest in a decent filtration and oxygenation system to reduce the frequency of cleaning the water. Even cleaning a very small tank proved to be quite a hassle and a production in getting Red out of his regular tank and into a temporary receptacle (usually some Tupperware) while I cleaned out his house. I only used distilled water in his tank to prevent contamination but this obviously did not work as well as I would have hoped. Having a good filter and aeration system would have made a huge difference and likely kept him from getting sick. I think it just would have been a nicer environment for him too. Also, now that I know there are medicines that you can get for common fish diseases, I would have investigated finding them a little further and probably administered some antibiotics or something of that nature once I saw he was not quite right. Since the fish was given to me, I did not really think of going to the pet store to get some assistance in caring for my fish. I am sure that the people there would have been more than willing to help me provided him with a clean and pleasant environment. It was a sad day when old Red had to take that big toilet bowl ride to the sky, I would not want to have to do that again. I was particularly interested in this article because I had a Betta fish at one time. I really enjoyed the experience but unfortunately I did not know a great deal about keeping one and he died within a few months. It was a sad occurence, I really liked having him to take care of and observe. He was a beautiful dark blue male that I naturally named “Red”. He was pretty responsive when I came around and I always wanted to make sure that I paid him some attention aside from just dropping his food in his tank. From reading this article, I now know what I did wrong. First and foremost, I did not keep him in a large enough tank. The fish was a gift from a friend of mine that gave me about a half gallon aquarium to keep him in. From what I knew of Bettas, I thought this was more than enough room for him to move around but now I know differently. The article recommended at least a twelve gallon tank and this is clearly a lot bigger than what I had. With more water, he likely would have had more room and the water would not have soiled as quickly as it did. The second mistake I made was keeping a fresh bamboo shoot in his tank with him. I too thought that the bamboo would oxygenate that water and provide him with some cover. I also occasionally saw him nibbling at the root system of the plant. I was not sure if this was a good thing or not, but it all seemed natural to me so I let it be. Now that I read this information, I would have kept the bamboo shoot separate and given Red his own tank of fresh water. The bamboo did contribute to the further dirtying of the water and it would be especially bad in warmer weather. It seemed like the organic material just fostered that much more algae growth and because the tank was not very large, I did not have a filter or anything else on it either. The last thing that really did Red in was that I was not able to change his water frequently enough to ward off disease. He eventually started to look a little sickly and I noticed that he was not swimming quite right. I would see him sit still for a while and I would go look at him and he would kind of swim a little and then just kind of float at the top. I knew that this was not a good sign, so I attempted to keep his water cleaner for a period of time. However I ended up having to go out of town for a couple of days when it got very, very warm in my apartment and the combination of heat, disease, and organic material lead to the water basically “blooming” with algae and that was it for poor Red. First of all, great article. Crazy to hear that the siamese fighting fish actually fight! So if I buy two betta fish and put them in a tank, will they start to duke it out?